Life, Laughter and Paris: My First Raclette - Mais Oui! 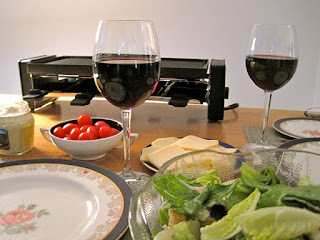 My First Raclette - Mais Oui! than the grill. It's the artist in me. Today I was out shopping, took a wrong turn, and ended up in kitchenwares. Normally I just zone out when this sort of thing happens but today, something caught my eye. A raclette grill. Now I may not know anything about cooking, but I do know blogs from France and I remembered seeing several posts on raclette dinners. Melting raclette cheese and scraping it onto small potatoes seemed to be the gist of these meals. From studying the picture on the raclette grill box, it looked pretty good. Not only were there cheese and potatoes, but other stuff too and all the guests were cooking and laughing and having such a fun time. Even more fun than in a shampoo commercial. Perfect. If I can get people to cook their own food, make them think it's part of the entertainment, and take the credit for dinner at the same time, this is the gizmo for me! I hesitated between buying the raclette grill and the fondue pot sitting next to it but I haven't read any blogs about fabulous fondues lately so the decision was easy. Next, I had to buy something to cook on this thing. Frozen food being 'out' I headed for the grocery store and picked up some shrimp, beef, small potatoes, a few other veggies, and the all essential raclette cheese. I didn't go too crazy on this in case the whole thing was a big flop and we'd have to order pizza. For our initiation into the world of raclette, my husband and sister were the 'volunteers'. Well, to be honest, they didn't know about it but I guess this was a good surprise - different from eating my usual slop fare. It worked! The raclette was a success! We cooked our cheese in the little pan things, and grilled the shrimp and beef on the top thing. I had cooked the small potatoes beforehand and the melted cheese poured over the potatoes was delicious. Actually, I could have just eaten the cheese. The grill I bought has 8 little trays so you can have 8 people for dinner. Unless of course each guest wants two trays to save time in which case you can only have a dinner for four. If each guest wants three trays, it's a dinner for two with a couple left over or you can have a third person who isn't very hungry. All kinds of possibilities! I'm really getting into this cooking thing! Fair warning is always a good thing:) Thanks for the visit Nicole! I would rather do ANYTHING other than cooking but you made this raclette grill sound like lots of fun and I may just buy one. I'm not much of a cook, either, but this sounds like fun! Great blog. Hey Peggy and Carol! I'd rather get on my knees and scrub floors than even open a can of soup but the raclette is kind of fun. Give it a try. If you get inspired and find anything else that's good to cook on this, let me know!